This is a do it yourself, although you can still answer the question (is it possible) in the comments below. Can you trace along all of the lines, without lifting the pen from the paper and tracing each line only once? If you need a hint, this is a rather complicated Euler puzzle. Don't forget to let us know if you were able to do it! UPDATE: SPOILER ALERT!!!!!!!!!!!!!!!!!!!!!! Scroll down if you want to see a possible solution. It's not the only one, but it does work. Follow the nodes around starting at 1, then move to 2, 3, 4, etc... You'll notice there are two odd nodes with three numbers. Start at the first odd node and end at the other to solve. Sorry, said "right" where I should have said "left" in one instance when I posted this the first time. 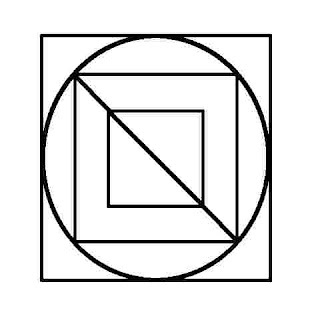 Begin at the upper-left corner of the largest of the two squares *inside* the circle. Follow the chord bisecting this square down and to the right until you hit the upper-left corner of the innermost square. Trace the perimeter of this innermost square clockwise, beginning at the corner and ending at this same corner. Resume tracing the chord bisecting the first (larger) square down and to the right, continuing to the end of the chord. Beginning at this point (which is the bottom-right corner of the larger internal square), trace said square clockwise along its entire perimeter, ending once again at the same point. Now, since this bottom-right corner corresponds to a point on the circumscribing circle, begin to trace the circle clockwise from this point, continuing for 315 degrees. You should end at the point corresponding to the midpoint of the largest square's right side. 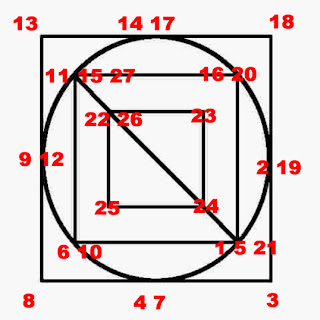 Trace this largest square clockwise along its entire perimeter, ending once again at the midpoint of its right side. Now, complete the remaining 45 degrees of the interior circle. All lines have now been traced, I believe. Start at the top left corner of the larger square. Go across the top, left to right. Come down the right side of the larger square. Go around the circle 315 degrees, clock wise. Stop at the 3 oclock position. Go around the outer square and return to same point. Finish the last 45 degrees of the circle ending up in the bottom right hand corner of the larger, inner, square. Go across the bottom, right to left of the larger, inner, square. Go up the left side. Come down the angled chord line to the inner square. Go across the top, left to right, of the inner square. Go down the right side of inner square. Go across bottom of inner square and up left side. Finish angled chord line to the bottom right and you should be finished. Or you can just copy and paste the picture to powerpoint and you are also finished. That's probably easier. A lot easier! There's no way I could describe the solutions as well as you two, so I'm just going to attach a figure in the original post to illustrate the answer (since it is possible using Euler's rules).